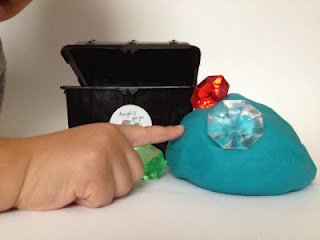 Gifts 2 Go Go Homemade Play dough Review! Halloween Blog Hop! If you are looking for a Creepy Crawly Halloween Treat for that special little one or even treats for handing out Gifts 2 Go Go is one of our favorites. Gifts 2 Go Go offers handmade crafts including homemade play dough, hand knit scarves, crocheted hats, aprons, and other gifts both for kids and adults. Our favorite is the homemade play dough they actually have kits to make your own or you can buy a set of play dough, single containers and the single containers have different little toys inside. My boys were super excited when we opened the package and they saw what was in the box! We found a giant play dough ball super well wrapped in plastic wrap for freshness and packaged with awesomely cute little Ninja play figures in a nice reusable plastic storage container! My kids played for at least an hour. The consistency of this is amazing I could tell little to no difference in the homemade dough compared to actual Play-Doh brand dough! The consistency was a big thing that sold me to as I had figured the play dough would be like all of my homemade play dough attempts chalky and grainy but this was not at all the case. The biggest benefit for me though is that the play dough is made with non-toxic natural ingredients and as everyone knows I try to go a natural as much as possible! If you want to place an order from Paula at Gifts to Go Go LLC then go browse her shop now here. I just keep thinking how great the party favor play dough would be for treat bags or trick or treater's. The 4oz play dough is on only $3.00 how can you beat that! One of my favorite items is the DIY Play Dough Kit a steal for $12! Oh these play dough sounds really fun. I like to go as natural as possible as well since my toddler still likes to taste test everything. The price is also pretty reasonable. Love it and great review! I like the red hand knitted ruffle scarfs. I love the different play doughs. My grandkids would really enjoy them. The Homemade Christmas Play Dough is really cute. The Christmas Play dough is cute and fun. My grandkids would love it. We like the Safari Play dough! So much fun! I really love the Minions Crocheted Hat. So cute and my niece would adore! I love the Minion hat for myself.